"I will hunt you down until you cease to haunt my eyes with hunger. I heard your foot-falls in the desert, I saw your shadow in old buried places, I heard your laughter running down a million streets, but I did not find you there. . . . But in the city of myself, upon the continent of my soul, I shall find the forgotten language, the lost world, a door where I may enter, and music strange as any ever sounded. . . ."
On Thursday morning, July 12, 2001, I drove from Pekin, where my wife's parents live, to Lincoln to visit my father, Darold Henson, and stepmother, Judy Henson. I turned off Route 155 onto Route 136, from where I turned south on Nicholson Road. When I got to the old Union Station, I got the idea of taking some pictures of places/things I had remembered from youth. Driving into Lincoln, I continued to snap locations as I passed Lincoln College, where I attended my freshman year (1960-61), and entered downtown. 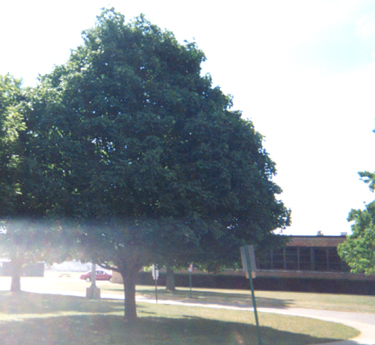 From there, I went to LCHS in search of Mr. Bass's memorial tree and plaque, which I had not seen for many years. Then, I drove toward Lincoln Lakes, turning onto West Kickapoo, where my Jefferson School classmate Bradley Fox's family had lived when his father, William Fox, M.D., was superintendent of the Lincoln State School. Then I went past the old Mill tavern and restaurant before reaching Dad and Judy's house. Later, as I headed back toward Pekin, I returned to the downtown to shoot the lights on the marquee of the Lincoln Theatre and then, driving toward the Interstate, I took pictures of the Logan County Fairgrounds and the remains of the Blu-Inn/Heritage Inn. Below are the pictures I got. Some are of poor quality. I was using a throw-away camera, and sometimes the side of the building I wanted to shoot had the sun behind it. The tour, a mini-pilgrimage, was all too brief and limited; but I wanted to have pics of some special places to help me remember them till next time, or in case there is no next time either for the places or for me. As on the Web page containing the Roy Rogers' Riders Club photos, here I use "thumbnail" photos to allow for nearly instantaneous page loading. Simply click on the "thumbnail" photos to enlarge them. 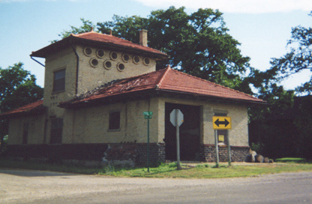 This station at Union, north of Lincoln, is an unchanged ruin. Was it an Interurban (sp?) depot? Remember the electric-powered train whose route included Decatur (? ), Lincoln, Mackinaw, Morton, and Peoria? Did the tracks run on Chicago Street? I was with David Lovelace when he drove Royce's station wagon on top of the tracks in deep snow ruts and had trouble steering back onto the vehicle traffic area. Lucky for Royce, no Interurban was running then (the vehicle was in the most danger as we could have easily baled out). 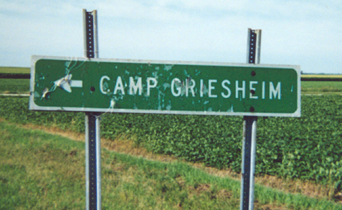 Was Camp Griesheim exclusively used as a Girl Scout Camp? Some of the side roads off Nicholson were traveled by young folks seeking safe places to imbibe "cold ones." Nicholson has long, straight, flat stretches suitable for two cars to drag race. Dark tire marks show its continued use for feats of acceleration. The little traffic there invites "the pedal to the metal," as this driver blew past unmowed shoulders of blue cornflowers, white Queen Ann's Lace, and pink clover. 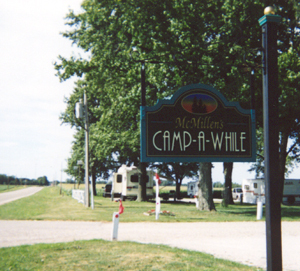 With Lincoln just over the horizon, the sign says "McMillen's Camp-A-While," a facility that seems to date back to the 1950s. Did Arnie McMillen live on a (dairy?) farm there? What became of him? 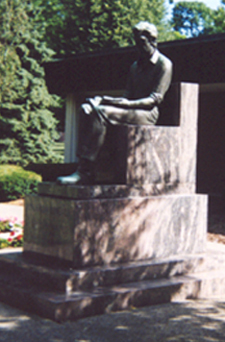 This bronze sculpture of Lincoln, the Student, near the corner of Keokuk and Ottawa, is the work of Merrell Gage. The statue was placed in 1961. Warning to out-of-town alums seeking tennis courts to challenge their in-town counterparts: the tennis courts across the street from the sculpture are now defunct, with surrounding fence and center-court net removed and court surface crumbling (more progress?). The statue reminds me of a story about Raymond Dooley, long-time president of Lincoln College, and great promoter of Lincoln lore and the Centennial (1953). He had been a student at Harvard (and LC students--and the rest of the town-- thought he had a doctorate from there. It turned out he had only an honorary doctorate from somewhere else, I believe). 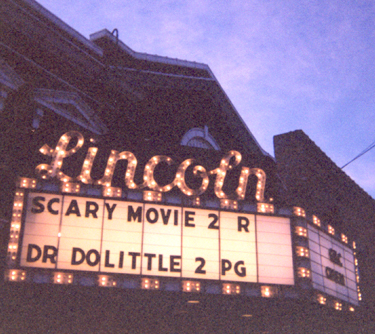 The story is that, as a student, a somewhat tipsy Mr. Dooley had climbed up to sit in the lap of the Lincoln statue at the Lincoln Memorial in Washington, D.C.
My only other RD story: one hot p.m. in the mid '60s in Gordon's Tap, next to the Colonial Restaurant, I was enjoying a 15-cent cold Schlitz draft when a car pulled up to the front door; and distinguished RD, with cane, noisily banged his way into the common man's pub. He consumed a shot of whiskey and then ambled out the door just in time for his driver to pick him up after circling the block. Timing is everything! 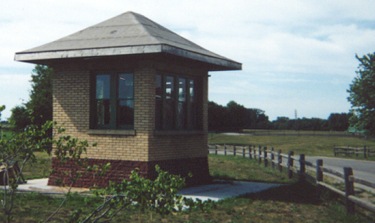 Known to townies as Harts' Hall, this structure, pathetically, has been in decline for years. 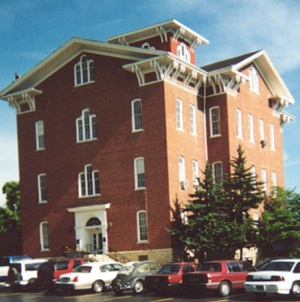 It was a women's dorm when I was at Lincoln College. In later years, faculty lived there. In approximately 1970 or 1971 at Christmas time, my first wife and I were the guests of Mrs. Florence Molen in her first-floor apartment (entrance from the side porch). She had decorated her tree with authentic Scandinavian ornaments in celebration of her heritage. Immediately west of Harts' Hall is another college residential building (cannot recall the name) used for faculty apartments in later years. Another English teacher, Mrs. Lois Hall, lived there (she lived on 7th St. when I was an LC student). She was from New England and was my freshman composition teacher and not my favorite. She evaluated writing based mainly on the quality of comma usage, and at that time, I had not gained much proficiency with it. Also, her voice was so soft I could not hear it from the back row, where I preferred to sit in semi-anonymity (before I gained studenting skills). 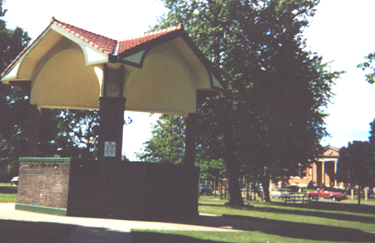 This pavilion in Latham Park was used by the American Legion Band during their frequent summer concerts in the 1950s. People often arrived early to find a parking place, so they could listen from their cars. Some folks sat in lawn chairs, and kids ran around and rolled on the grass while the band played such classics as "Washington Post," "Stars and Stripes Forever," and "March Grandioso." 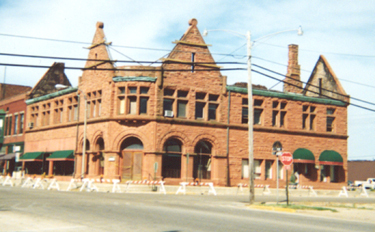 The landmark Carnegie Library can be seen in the background to the right. The library now has a scanner, thanks to the benevolence of Fred Blanford. Like a plundered castle, the red-sandstone (?) Scully Building sits in ruin from a fire last winter. Last thing I read at www.lincolndailynews.com was that the city inspectors had not condemned it, and the owners were going to try to rebuild. One of the places where a guy first offered a girl popcorn and then wondered how long to wait before trying to put an arm around her shoulder (and how far to reach). The Grand Theater and the Vogue are long gone. The Grand had burned to the ground. In the early 1950s, my father took me to see various films, including The Thing at the Grand, where I remember James Arness as "the thing" had women screaming at the top of their lungs. 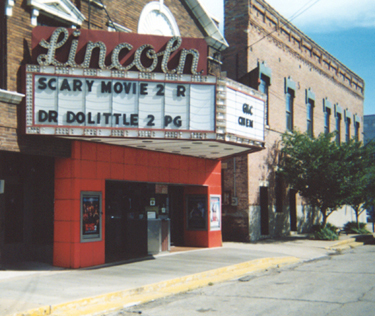 Also, see http://lincolnhigh1960.tripod.com/rrrc.html for Mr. Paul Million and the Lincoln Theatre Roy Rogers' Riders Club photos and members' stories. I hope these lights will be the last ones turned out in Lincoln. 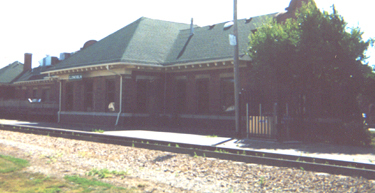 The Lincoln Train Depot: one day at the end of the Korean War, all schools were dismissed so that everyone could go to the station to see and welcome home a man who had become a veteran of both WW II and Korea. Another time, I remember an aunt and uncle leaving from the train station to go on their honeymoon. I had been given a bag of rice for throwing. Cautiously, I grabbed one handful and took the bag over to the wall to store it there for re-loading; but when I returned, another aunt had snatched it up and, oblivious to my pleading, was emptying my sack. Site of Dial and Jones's, then Dial's, Texaco Station at Fifth and Union. Harry Dial and "Putz" Jones had been IL state troopers. Harry liked to tell a story of how he once pulled "Squire" Scully over on Rte. 66. 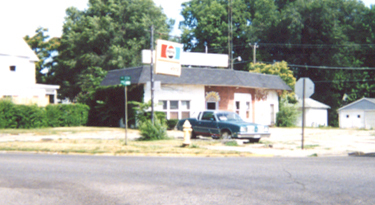 This station was patronized by local politicos, business folk, elderly ladies who needed a competent oil change (Dial drained the oil for 20 minutes to remove as much debris as possible), and dozens of young guys, who found access to vending machines with cigarettes, candy bars, and Cokes. Dial cautiously allowed teen guys to borrow tools and wash cars, and the station was a sanctuary where they could go watch tv without having to see Lawrence Welk. I believe Diers has a story about Classmate Mike Berry trying to drop a lighted match into the open pipe of an underground gas tank. The tree near the alley where we carved our names is gone. His "guys" in later years secretly bought him a new desk and office chair (got a good deal from Thudium's Lincoln Office). While Dial was at dinner, the new furniture was installed, and the old pieces were placed on the big curb out front, chair stacked on top of the desk. We had the hired man, Wayne Charron, call Dial to tell him he had better come down to the station right away as there was trouble. Harry, arriving, seeing the furniture, and knowing his office had been "vandalized," pulled onto the middle of the drive in his old blue truck, stopped, got out, and entered his station with a very red, angry face. Then, amazed, he saw his new office, and Pete Ross asked him, "Now that you like 'em, do you want to buy 'em?" The closest (short) front wall has protruding bricks, which Ron Castor once used to try to climb to the roof. He was more successful using this technique to climb to the roof of the Logan Lanes Bowling Alley. As I recall, some folks in the first class to graduate from the new campus ('59) tried to continue the tradition of painting numerals on the chimney, but the practice was not appreciated by the administration (the Comrade in his last year at LCHS). Seems I remember there was a tizzy over cleaning it that year. Anyone have any stories about this incident or about painting numerals on the chimneys of the old campus? I don't know much about this structure. Was it a train switchman's station? It is on the road to Lincoln Lakes and signaled the entrance to a favorite playground that included Salt Creek, the dam, the "hot water ponds, and the back lakes. Many of us learned how to "camp," swim, fish, boat and canoe, and water ski in these environs. For photos of Lincoln Lakes, visit www.BradDye.com/lincoln.html. 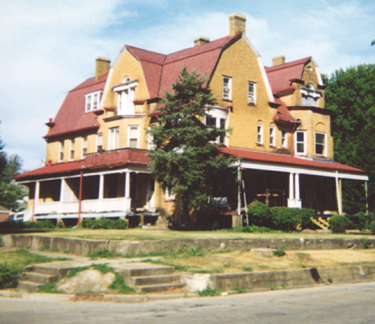 On west Kickapoo, the former residence of the superintendent of Lincoln State School & Colony. 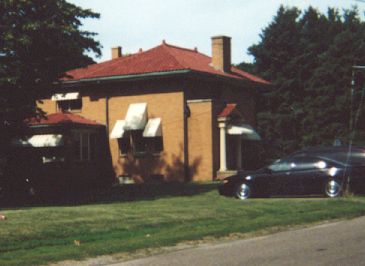 In the 1950s, the family of William Fox, M.D., lived here. The older son, Bradley, was a classmate of mine from grade school through high school. I remember a couple of classes (4th grade?, 5th grade?) being invited there for wiener roasts. Our teacher and Jefferson School principal, Miss Bernadine Jones, lectured us on what a privilege it was to go there and how important it was that we behave properly. It seems I recall Bradley showed us how he could climb out of his second-story bedroom window onto some kind of pole and slide to the ground. The house and grounds did indeed seem like a rich estate to us kids from the rough part of town. The "Y" now occupies the building. 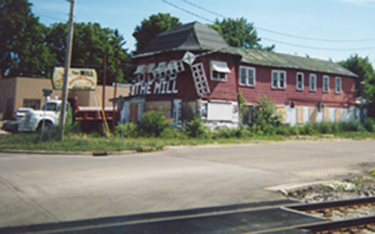 The Mill just north of the State School, where I taught Jeff Fults and others how to play shuffleboard. 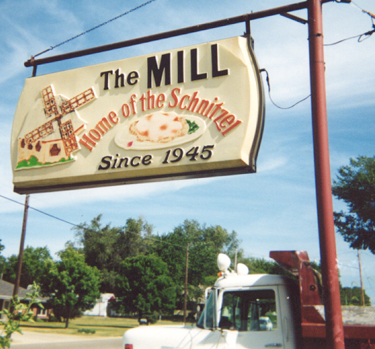 Read a brief history of the Mill and the Schnitzel. One hot summer afternoon in the mid 1960s, I was with a friend or two at the bar, admiring the collection of old beer cans on the wall, when George, Jr., son of the owner, came in, followed by his wife. She was giving him all kinds of hell for whatever reason. George, Jr., quietly took his place behind the bar, while the Mrs. pursued him, growing increasingly vocal. Frustrated with his disregard for her rhetoric, she reached under the bar and pulled out a pistol, waving it at him. My friends and I froze in fear. We quietly finished our brew and left, expecting to hear gunshots at any moment. 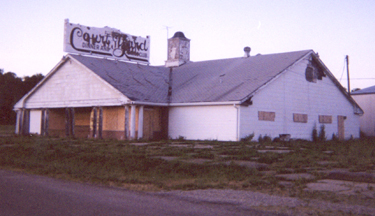 Others I had seen patronizing the Mill include Jim Benner, Cynthia Stoltz, Vic Thudium, and J.P. Ressetar, who in the winter of '68 or '69 helped me push my red Triumph-4 British sports car out of a snow-covered ditch there, where I had taken my first wife on a date. I had taken her there so she could enjoy the local culture. She was a Pekinite and used to the crudities of that river-front, whiskey-laden community and unfamiliar with the more refined hometown culture afforded by Lincoln. The Schnitzel covered the plate. Logan County Fair Grounds: many guys, young and old, worked "taking tickets" here. For many years after leaving Lincoln, some guys like Duane Woltzen returned to do this job and visit with old friends. In August of 1955, I went to the fair several times by climbing over the fence at the southeast corner of the fairgrounds. I believe that August I heard Elvis on the radio for the first time, as everyone was talking about him. The next spring at the 8th grade picnic behind Central School, I wore blue-suede shoes. Twilight at The Blu-Inn--Heritage Inn (later the Court Yard): featured coffee shop, dining room, and bar. 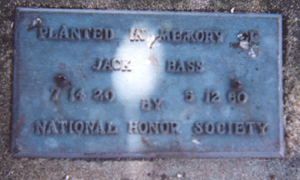 I remember seeing Jack Bass there in a day and age when teachers in Lincoln were disallowed from visiting taverns. Legend had it that JOH would ask for the resignation of any teacher caught/seen in a bar. One of the Class of '60 told Duane Woltzen he had been seen leaving a liquor store with a six pack, and the coach fervently denied it while fighting a grin.